Welcome to the award-winning Castlehill Restaurant, a stone’s throw from the thriving Dundee waterfront. Come and enjoy our sophisticated Scottish menu using locally sourced produce. Our Chefs and team warmly invite you to try a unique taste of Scotland here at our small, elegant and award-winning Castlehill Restaurant, Dundee. At Castlehill, we deliver an ever-changing seasonal menu of sympathetically handled Scottish ingredients. 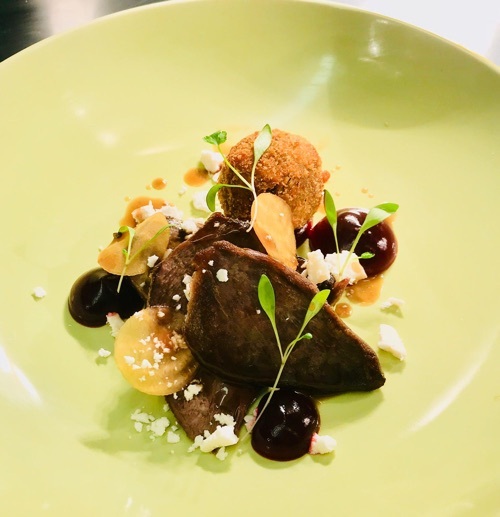 A modern cuisine, based on classical techniques, showcasing the best of Scotland’s regional larder sourced from land and sea. While the purity of ingredients shines through, We introduce a twist of creativity to every dish. "This is a fine dining experience of the highest degree. Elegant service, excellent food, beautifully prepared and explained. An excellent wine list and prices that are within limits especially considering the high quality of our dining evening. A 'special night out' venue." "What you'd expect from a Michelin one starred chef. With the opening of the V&A museum in September this year it is reasonable that Dundee will start to draw a more sophisticated set of international travelers than it has in the past. This restaurant will not disappoint those foodies in the crowd." "Have had lunch here with friends but thought would try dinner when on a stopover in Dundee with my husband. This is fine dining at its finest. Beautiful food, beautifully presented. I can't think where you would have a better meal, particularly for a special occasion or be like my friend for a wee treat at lunch time if your week going a bit rubbish. It's a treat but well worth it." "A friendly welcome, an excellent wine list and a menu that fulfilled our expectations. Well presented meal with a taste to match. Very well recommended and good value for money. Staff went out of their way to assist"